I recently bought one of those cheap Chinese cyclone doohickeys on ebay to connect to my shop vac for my miter saw. The shop vac is a Rigid 9 gallon 4.25 horsepower. The problem is pretty clearly show in the picture below. The home depot bucket collapses inward when I use it. Also, 90% of the dust is ending up in the shop vac, not the bucket. I have the hose going to the shop vac from the side port of the cyclone and to the mitersaw from the top port of the cyclone. Not sure if it matters but I’ve got the bucket buttoned up pretty tight with silicone around where I cut the hole to connect the cyclone to the bucket. Do I need to drill a few holes in the top to let some of the pressure escape? If it’s relevant, the OD of the hose that connects from the cyclone to the miter saw is 1.25”. There are a couple of things. First, it looks like you have the inlet and outlet of the little cyclone reversed. That may just be an illusion from the picture though. If it is true then your cyclone is nonfunctional. The second thing is the 1.25 inch hose going to the saw is too small. You need a 2.5 inch hose to support the air flow you need. The inlet to the cyclone is acting like it is plugged up due to insufficient air flow. I think you have the hoses reversed. Shop vac should go on top, and the dust comes in the side. Switch that first and see if it helps. FWIW, I have a similar setup, and I nest the bucket that captures the dust inside another identical bucket. The outer (lower) bucket is screwed to a cart. I suspect that if you did that it might help support he sides. Something to try, anyway, and it doesn’t cost much. Next thing to try is to use a larger hose downstream. I use a rubber plumbing reducer to (1 1/2” to 2’ IIRC) to attach a larger hose between the cyclone and the source of the dust. You’ll have to measure to get this right because nothing in the plumbing section is named the actual size. Agree, you have the hoses reversed. I have one of the Oneida kits that comes with two buckets I got at Lowes when it was on sale. I hook it up to a shop vac that is larger than yours when I use my ROS. The hose to the ROS is only about an inch in diameter and it a good fifteen feet long. 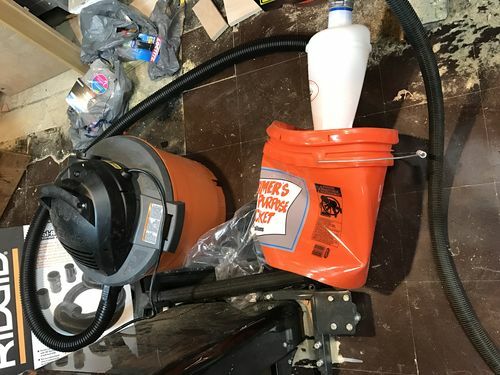 I have never collapsed a bucket and I am amazed at how well the system gathers the sanding dust and how virtually all of it ends up in the bucket, not in the shop vac. I suggest swapping the hoses, and looking for a beefier bucket. Now that the one you have has collapsed it is weakened and will easily collapse in the future. Hoses are definitely backwards. Shop Vacuum to TOP of cyclone, you vacuum with whatever attachment you’re using from the SIDE of the cyclone. In terms of the diameter of the hose going to the miter saw—the reason I was using the the 1 1/2” OD hose is because it was what I had that had a connection that fit onto the miter saw. I guess I’ll have to mess around with another house and some plumbing fittings at HD to try to find something that works with a larger hose. Open to suggestions. I agree with the others, your hoses are reversed. Your bucket is collapsing because of the high vacuum level. A stronger bucket is needed. There are several options for this. Metal 5 gallon buckets are available, but quite hard to find. Ceramic Tile installers would be a possible source, since some of their materials come in them. Firehouse Subs sells their used 5 gallon plastic pickle buckets for $2 each and donate the proceeds to the local fire companies. These buckets are plastic, but much stronger than your Home Depot bucket. Unfortunately, it’s difficult to get the pickle smell out of them unless they are used for other purposes for about a year, or left out in the Sun for a couple of months, so expect your shop to smell like a dill pickle when you use the vacuum and one of these buckets. Even these buckets will collapse under high vacuum, but not as easily. My shop vacuum system is a re-purposed whole house central vacuum system unit and will collapse even these pickle buckets easily, but not when I put three of the buckets stacked together. Each Firehouse bucket has stiffening ribs around the upper 1/3 of the bucket. By stacking 3 buckets together there will be stiffening ribs all the way down the top bucket. Attach your Dust Deputy to the lid for the top bucket, and you will not have a collapsing problem. I used my vacuum system for about a year this way with no collapsing problems at all, but the top bucket filled up too quickly. The smell was gone after about 6 months though. II now have my Dust Deputy attached to a plywood lid (2 layers of 3/4 birch plywood). The bottom layer just fits inside the barrel, and the top layer is bigger to fit over the top of the barrel. It now fits on top of a 20 gal metal grease barrel (taller, but only slightly larger in diameter than a 5 gallon bucket) that my son found for me. I used several of the rubber O rings from the pickle barrel lids, stretched around the bottom layer of the plywood lid to help seal between the lid and the barrel. This has worked great and I can go months without needing to dump it. Truck Fleet maintenance shops are a good source for these grease barrels. The grease comes in a plastic bag inside the barrel, so the barrels are relatively clean when empty. Be polite and ask the mechanics to save one for you. A 6 pack of his favorite would be a fair trade that might get you more if you want them. I’m wanting more to use as shop trash cans. A spare for the dust collector would be nice too. II now have my Dust Deputy attached to a plywood lid (2 layers of 3/4 birch plywood). The bottom layer just fits inside the barrel, and the top layer is bigger to fit over the top of the barrel. I used silicone caulking to seal/glue the plywod together, plus screws andsealed the Dust Deputy to the plywood with this caulking as well. This lid now fits on top of a 20 gal metal grease barrel (taller, but only slightly larger in diameter than a 5 gallon bucket). I used several of the rubber O rings from the pickle bucket lids, stretched around the bottom layer of the plywood lid to help seal between the plywood lid and the barrel. This has worked great and I can go months without needing to dump it. Truck Fleet maintenance shops are a good source for these grease barrels. The grease comes in a plastic bag inside the barrel, so the barrels themselves are relatively clean when empty. Be polite and ask the mechanics to save one for you. A 6 pack of his favorite would be a fair trade that might get you more barrels if you want them. I’m wanting more to use as shop trash cans. A spare for the dust collector would be nice too. Any leak below the Dust Deputy will cause turbulence in the sawdust, which will cause the sawdust to get past the Dust Deputy and into your vacuum. If you suspect a leak problem, a spray can of smoke liquid for testing smoke detector type fire alarms works well. With relatively still air in the shop and the dust collector running, spray a little smoke near where you suspect a leak. Watch the smoke closely. It will be drawn into any leak and you will see it’s trail. Don’t use a smoke source like a cigarette because a spark could cause a sawdust explosion. If you find that the filter inside the shop vac is collecting more than just a trace if dust you likely have a vacuum leak below your Dust Deputy, or your bucket/barrel is full. In terms of the diameter of the hose going to the miter saw—the reason I was using the the 1 1/2” OD hose is because it was what I had that had a connection that fit onto the miter saw. I guess I ll have to mess around with another house and some plumbing fittings at HD to try to find something that works with a larger hose. Open to suggestions. “dust right” fittings are slightly different than what comes with different vacuums and tools. They have all the stuff, but you have to be sure what you’re getting will match what you have to start with. HD/Lowes have some fittings, but only a subset. I have my mini-cyclone hooked to some 2” PVC that serves a few different tools along one wall. For that, I used some rubber plumbing fittings to manage the transitions. Last thing, I have one of those 1 7/8 “pro grade” hoses from HD, and it’s very durable, but it’s slightly narrow, so it gets clogged too often at the opening (it tapers down just enough to be a problem). I wish I could find one cheap, the same quality, but a bit larger diameter. Just giving some ideas that I hope are useful. Didn’t catch it above, but in case someone didn’t mention it, sealing the cyclone is critical or some or all of the debris vacuumed will be drawn through it, rather than spun out and dropped under it, into the bucket. I acquired some incense to test where the cyclone bases connect to the bucket top and such. If all is working well, you’re going to love that your filters stay clean far longer than before.